Do you carry a laptop with you just to take notes in a class or meeting? Wouldn’t it be easier to just use your smartphone, iPad, Android phone or Android tablet? We know what you’re thinking… typing on that glass screen is a pain compared to typing on a physical laptop keyboard. Well, we’ve got just the thing for you. 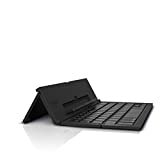 Check out the ZAGG Foldable Wireless Pocket Keyboard Universal for Smartphones, Small Tablets, Apple and Android Devices, which is surprisingly affordable and is very well liked among users. Natural: Maintaining over 85 percent the typing space of a desktop keyboard, the Pocket Universal delivers the same fast, natural typing experience you expect from ZAGG keyboards. Smart: Strong magnets keep the Pocket Universal folded and help maintain battery life by automatically turning it off when closed. Convenient: A built-in stand secures phablets and smartphones at an ideal viewing angle for simple use anywhere. Lasting: Its powerful lithium polymer battery lasts up to two years of regular use between charges.